Made of nylon, with natural flavoring. Not consumable. Small shavings, no larger than a grain of rice, should pass throuhgh without difficulty. Replace when knuckles are worn down. Read enclosed guidelines for use before giving to dog. Size: souper. 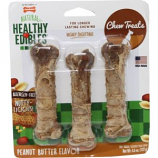 Nylabone - Durable Chicken Bone - Souper product is categorised under Wholesale Nylabone Products, PA products, Wholesale Dog Products, Wholesale Toys, Wholesale Chew Toys.